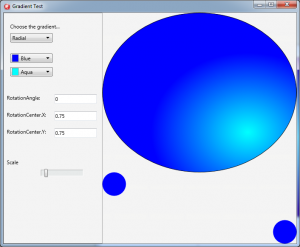 (Update 2015-06-14: Note that the article below has been updated to set Radial Gradient Center Point and not GradientOriginOffset (or focal point) . Setting GradientOriginOffset can skew the gradient and lead to incorrect results). First is a small cosmetic problem. Why was Embarcadero using RadialTransform.RotationCenter? Rotation Center seems a poor naming choice for the center of the gradient. Probably, the RadialTransform.Position would have been a better choice. Why were they setting the Center of the gradient and not the GradientOriginOffset? The center of the gradient was specified by using a value from 0 to 1 and was translated by where the rectangle was, meaning that it scaled to the rectangle it was being drawn in. If you changed the rectangle size or location, the gradient would be drawn correctly. You cannot set TTransformation.Matrix property directly. It is read-only. The TTransformation.Matrix property is generated by the class when you modify the Position, Scale, and Skew properties. But the Skew property is protected. You can hack the class to get to the Skew property but it is certainly not straightforward. Even worse, you need to set the transformation matrix using absolute values, not proportional values between 0 and 1. To translate the gradient center point, you need to know the rectangle it will be drawn in the future to create the gradient brush. And because the gradient center was not offset by the ARect.TopLeft, you have to take that into account too. Even worse than that, since you must use absolute values for the gradient, that gradient can only be used correctly with one rectangle or object. In addition, even if the gradient on a TEllipse or other shape is set correctly, if that TEllipse is moved or resized, the gradient is wrong. You cannot share that gradient with another rectangle. Radial Gradient in XE8 (Centered Origin 50%, 50%). Note how the bottom right ellipse has lost its centered gradient because it is drawn in a rectangle that is not at the origin. Radial Gradient in XE8 (Origin Down Right 75%, 75%). By clever manipulation of the transformation matrix, we set the focal point to (114,94), which works for the top Ellipse. However, the same gradient does not work for either of the other ellipses since their rectangles are different. Note that the FMX GDI+ never worked, but since that canvas was used rarely, this issue was ignored by the RSCL. What does this mean for the RiverSoftAVG SVG Component Library? First, because there is no easy way to set the gradient center point or focal point correctly and even if we did, the behavior would break as soon as a SVG element was moved or resized, we are not going to change the code for how radial gradient’s are set at this time. Using the default Embarcadero XE8 DirectX2D code on Windows for radial gradient with a non-centered focal point, the gradient will be displayed incorrectly. On other platforms and earlier versions of Delphi, the radial gradient will work as well as it ever did. Alternatively, you can download the changed file. As a bonus, the above code uses the AGradient.RadialTransform.Scale property as a proxy for setting the radius of the gradient (the RSCL has set the scale based on a SVG element’s radius since February 2015 but it is unused without the above hack for each platform and version of Delphi you are using). Well, that’s it for now. I hope this helps others. Happy CodeSmithing! This entry was posted in Coding on April 28, 2015 by tgrubb.